Of course, this is a country where, on one night this week, members of the public took to the streets in Cleveland, New York, Miami, and Chicago. War protests? Power grid failures? Job creation meetings? Worried about the oil spill in the gulf, perhaps? Nahh…people wanted to know where James was going to sign as a free agent, and took to the streets – Clevelanders burned James’ jerseys, so incensed were they – to either celebrate (Florida) or scream in anguish (New York and the other cities). The Post apparently can’t get over the fact that James didn’t want to sign with the New York Knicks (owned by another enemy of a fair, balanced media, Cablevision owner James “Nepotism” Dolan, who now controls what used to be a newspaper, Newsday). But back to the angry mobs on the avenues: Hey, dolts – when seafood is $11 a pound, you gonna take to the streets? When the neighbor’s kid comes home from the Middle East in a box, are going to pound the pavement? When temperatures hit 118 in the U.S. mainland this year thanks to “non-existent” climate change, you gonna hit the bricks? Oh, sorry…y‘all only do what the TV box tell ya to. Forgot about that. 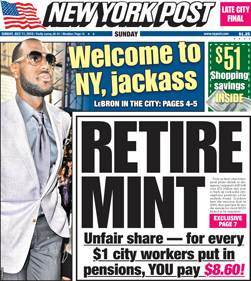 Thanks to The New York Post – not to mention ESPN – for keeping us so smart and informed.